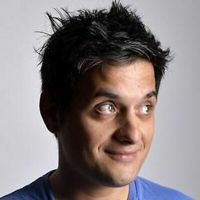 George moved from Greece to study Biochemistry in Newcastle Upon Tyne and, in doing so, avoided joining the Greek army for his national service.He discovered stand-up comedy years later, his first gig being on St Patrick’s Day in a dark room above a pub in Newcastle’s city centre. Fortunately for him, it turned out that he had a grasp of the English language as well as a talent for the art of comedy and soon this “really likable comic” went on to play all over the UK and abroad at some of the most prestigious comedy clubs, such as The Comedy Store and Glee. He has also appeared at the Edinburgh Festival in the CKP LunchTime Special.